Dave Collard operates Diamond Dave's Detailing in Green Bay, Wisconsin. He's been sprucing up cars since 1993 and went into it full-time six years ago. He does a lot of research before selecting tools, products and processes to use in his business. While he does owner work and dealer work, one of Dave's favorite jobs is detailing a collector car, whether it's a Classic Packard or a hot Mustang. 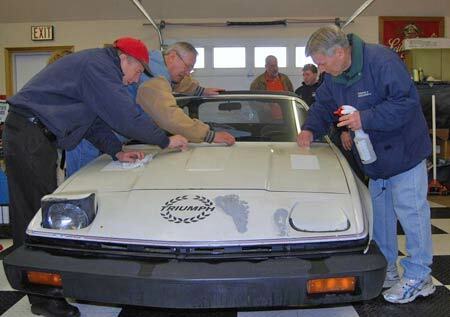 Dave Collard of Diamond Dave's Detailing in Green bay started by washing the 1980 Triumph TR7 roadster. Being from the frozen tundra of Green Bay, Dave knows what winter is and he also knows that it is a good idea to detail your collector car before putting it into winter storage. Dave starts a job by using the two wash bucket method to clean the car, being sure to use a grit guard (available at www.autogeek.com) in both buckets. He dips a clean sponge or rag in the first bucket and washes the car. He washes off the sponge or rag in the first bucket and, then, in the second bucket. The grit guard keeps grit at the bottom of the bucket and rags don't pick up any dirt. A soft, clean microfiber cloth is used for or cleaning. Work from the top down. Use a different rag for the wheels. Always wash the towels. Don't throw them in your garage to collect dust and dirt. Use clean towels for drying, too. If you're going to buff and polish the car after you wash it, just use Dawn dish soap to get the old wax and polish off. If you're just washing, use a car wash product. You can dry the car off with a synthetic chamois, but if used wrong these products can scratch paint. Water blades can also scratch. The really best method is to blow the car dry with a leaf blower, but don't blow dirt back on it. Use a water blade only if you're sure the blade is clean and the car is washed. Don't worry about drying if you're going to clay bar the car. Clay takes off contaminants like brake dust embedded in the paint. Dave uses clay on every vehicle he details. He clays the entire car top to bottom to get the paint glossy and smooth. 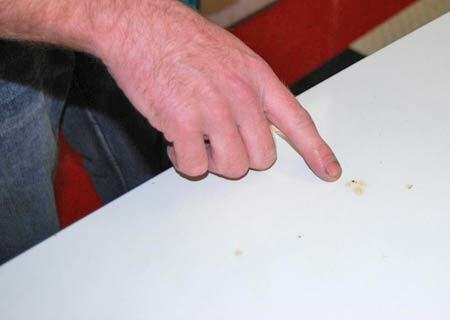 He's found brake dust contamination even on the roofs of cars. Some cars feel so rough that you'd think they were made of sandpaper. 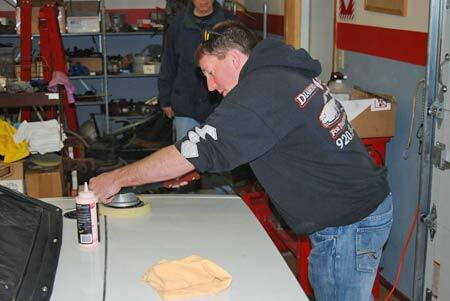 For a winter storage seminar, some talented volunteers chipped in to help Diamond Dave clean the paint with pieces of the Meguiar's clay bar. Clay is like putty. A bar costs about $25, so don't use it all on one car. Break it into pieces. Another reason for breaking it into pieces is that you don't want to re-use clay after contaminants get in it. Fold the clay over and over in your hands before using it. A lubricant is used to moisten clay. Dave uses Dawn dish soap as his lubricant. He puts a few drops of it on the car with a sprayer. 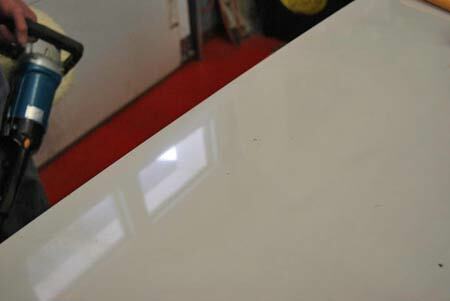 The paint on the Triumph's trunk looked white, rather than yellow, after it was cleaned with the Meguiar's clay bar kit. Dave normally washes the car after claying it, but before polishing it. He rinses the car off completely to get the Dawn residuals and clay residuals off it. You get the clay residuals off by washing the car and wiping it off with clean rags. Clay from the top down, too. The further down on the car you go, the worse the finish is going to be. You don't want contaminants built up on the bottom of the car to be dragged upwards by the clay. Clay won't scratch the paint unless there is dirt in the bar. Always check the clay and make sure there's no dirt chunks in it. Folding it over in your hand also helps prevent this. At first the car will feel rough. As you clay it, the paint will feel smoother. Some suppliers offer smooth and coarse clays. On a rougher finish, you use the coarse clay. Coarser clay will dull the paint, but you're going to be buffing and polishing your finish, so it really doesn't matter. Move the clay in a back and forth direction. Don't go in circles. It's very important to continually keep it lubricated. You will be able to really feel the difference where the paint has been clayed. The clay will take out brake dust, factory residues, air pollutants and foundry dust, etc. When Dave used the clay on a 1980 Triumph TR-7 that didn't have clear coat paint, he noticed that the older paint was harder to clay and he needed the coarser type. On any cars with clear coat paint, the less abrasive type of clay will work. You will probably have to use added pressure on cars without clear coat paint. On the newer cars, less pressure is used. But, no matter what kind of paint you have, clay the car before buffing and polishing. By lifting out the contaminants with clay, you don't wind up buffing them into the paint. When you're finished claying, wash the car with clean towels. You'll see that you got a lot of junk out of the paint. Now, you're to buff. Some people spray water when they buff, but Dave thinks this is messy. Before buffing a convertible, cover the top. You'll also want to tape off the gas cap, pin stripes and other areas that shouldn't be buffed. Tape off rubber moldings, because you don't want to get a cutting compound on rubber. Some door handles need to be taped off, too. Dave uses two types of buffers to apply cutting compounds to buff the clay-cleaned paint. He started on the Triumph TR-7 with a double-sided Meguiar's white wool pad on a Makita orbital buffer, a machine that's ideal for ultra-slow polishing. According to www.factoryauthorizedoutlet.com the Makita No. 9227C seven-inch electronic sander buffer is a variable-speed (0-3,000 rpm) buffer motor with pre-set maximum speed dial. A speed setting dial with pre-selected no-load speeds from 600-3,000 rpm provides maximum control. Several tools and a wide assortment of car care products from various manufacturers were used to detail the car and make it look much better. Electronic speed control provides a constant speed while under load. The buffer also easily converts to a sander. A lock-on button is used for continuous single-speed buffing. You can buy this buffer, a hook-and-loop backing pad, a hex wrench, a hoop handle, a side handle and a polishing kit for around $200.00. Dave's also uses a random orbit polisher to finish the job without swirls. Dave starts a rough car by buffing it with a wool pad on the Makita orbital buffer. Then, he goes over this with a foam pad on his random orbital buffer. He tries to get as close to a mirror finish as possible. He uses several types of foam pads including a red cutting pad, a softer yellow pad and a real soft black pad. Using a foam buffing pad on a random orbit buffer, Dave did some final polishing. Hold the buffer flat with light pressure and let the tool do its job. Dave considers Meguiar's Mirror Glaze No. 105 Ultra-Cut Compound to be a "real good polish." According to Auto Geek, this compound utilizes exclusive, super-micro abrasive technology that effectively levels blemishes and leaves a nearly wax-ready finish. It is body shop safe, paintable and contains no fillers. Unlike traditional compounds that leave compounding swirls, it leaves few—if any—swirl marks. A quick pass with a finishing polish may completely restore the shine and prepare the paint for wax. 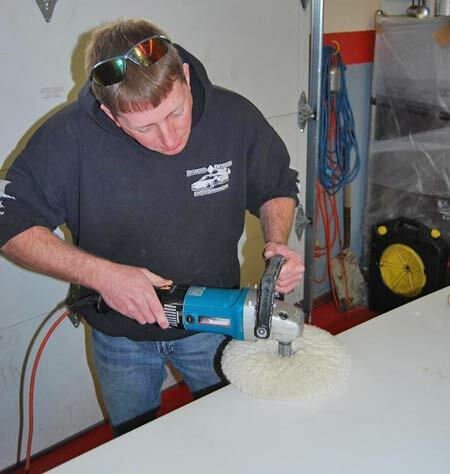 A wool pad on the Makita orbital buffer was used to do apply the Meguiar's No. 105 Cutting Compound to one section of the car after another. No. 105 should be applied with a polisher if you plan to compound the entire vehicle. Auto Geek recommends a maximum speed of 1500 to 2000 rpm with a foam or wool cutting pad, but Dave says this varies from one detailer to the next. Dave likes speed 3 on the Makita. He recommends working until the compound starts to dry. Then, wipe off the residue with a clean microfiber towel. Dave likes to follow up with Meguiar's Mirror Glaze No. 205 Ultra Finishing Polish to completely restore the gloss. Dave says that No. 105 does not have a lot of grit like the older compounds that had lots of sandpaper-like grit in them. You can wash buffing pads. Squirt them with a cleaner. A very old wax-caked pad might have to be soaked. Pads take a while to dry Dave uses his Makita to spin them dry. Pads can be re-used, but to order new ones visit www.autodetailingsolutions.com. It's a good idea to wear safety glasses when buffing to protect from flying wax, dust and possible power tool accidents. Meguiar's Paint Re-Conditioning Cream is a pink liquid used to cut, polish or wax via a one- or two-step process. To apply it, you switch to the least aggressive tool and pad combination for Step 2 and re-apply the cream. The No. D15101 Paint Reconditioning Cream is specifically designed for high volume reconditioning facilities such as auctions, detail shop and car dealerships. "It's a real quick product that you use on a yellow foam pad," Dave pointed out. "If you are not doing paint correction and the finish on the car is not in bad shape, you can use the conditioning cream and then you'd wax the car after that." The product will bring out an average paint job. To get his finishes smooth, Dave has big lights on wheels and he looks at the panels he's polishing under the lights so he can see the spots needing work. When applying any polish, start by shaking the product. Then, put a small bead across the panel being polished. Next, go back and forth with your buffer, making sure to overlap the strokes. Dave says that if you go sideways, you'll then want to go up and down, too. He does this five times. You can use any pad with any product and go at any speed. Everybody prefers their own favorite speed. 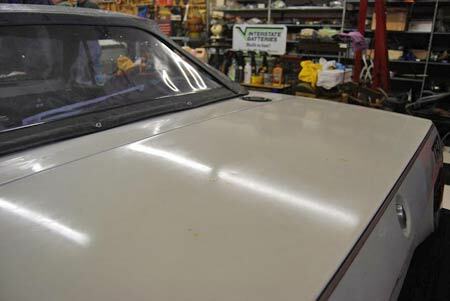 When Dave finished buffing the TR-7s trunk lid, you could see the improvement. The polished side looked much whiter than the unpolished age-yellowed side. His wool pad made the difference. You can't use just foam pads to achieve the type of paint correction the Triumph needed. With the wool pads you take the scratches and oxidation off the old paint about three times faster than with a foam cutting pad. With the more aggressive wool pad you have control. Before buffing, you should mask off door handles, gas caps and pin stripes. Dave said the decal on the nose of the TR-7 was so worn that he would remove it with a heat gun and get a new one. (They are available from TR7 Spider by emailing sales@tr7spider.com or calling (920) 730-0000). Some people use plastic razor with a heat gun, but Dave thinks they can scratch paint. A wool buffing pad will gunk up with cutting compound. Detailers use a spur tool to clean them. After finishing a car, you should clean the pads with a spur and wash them. Then, you'll be able to re-use them many times. Normally a cleaning spur is used to take excess product off the buffing pad, but in a pinch, a screwdriver can be substituted like this. This small brown rust spot on the Triumph's trunk is something that can be eliminated with proper buffing. After buffing with a wool pad and Meguiar's No. 105 Cutting compound, the rust is gone and the bare spot is nearly invisible. It should be touched up. 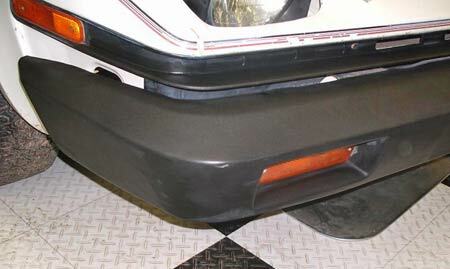 New rubber bumper restoration kit from Showroom New was used on TR7 bumper. 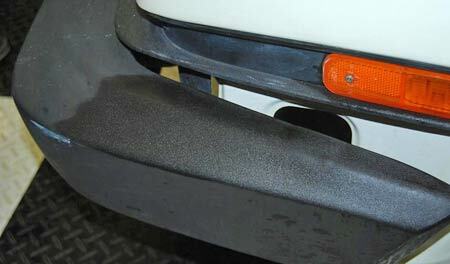 With just black dye applied here, the bumper has a shiny, textured look. After allowing Showroom New rubber bumper dye to dry overnight, we applied the white polish. It made the black rubber bumper look almost new. Dave mentioned new nano polishes that are less aggressive than those already mentioned. These Menzerna polishes come from Germany. They were developed in conjunction with BASF and Mercedes-Benz. They're formulated specifically for removing scratches, swirls and overspray from hard clearcoat finishes like those used by on Corvettes and Mercedes-Benz's CeramiClear. When you're working on a ridge or edge, go slower and be more delicate. You don't want to wreck or ruin the paint on the edges. Careful on plastic panels. If you bear down with a wool pad you can heat up the paint and burn it. If you're not sure it's metal, check with a magnet. 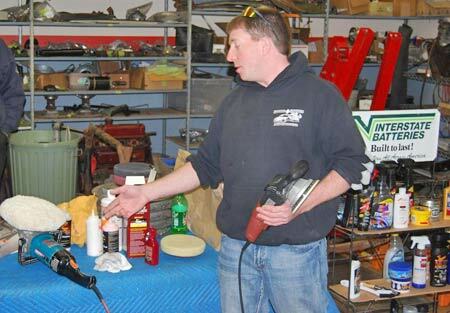 Moldings, drip rails and wipers can chew up a $30 buffing pad in no time. 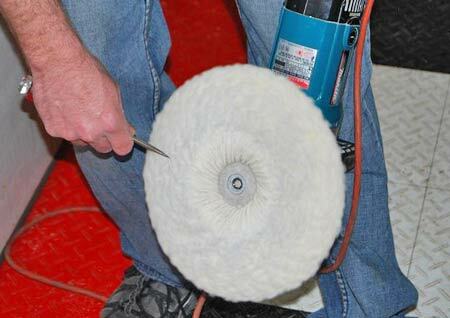 A buffing tool can hurt you if it gets caught up in something and jumps. Center your pad. If it doesn't get centered, it will spin off center and create swirls. Makita has a self-centering backing pad guide. When done washing, buffing, polishing and waxing, put the car outside in the sunlight and hit all the little cracks with a detailing brush. Never use wheel acid. It's made for quick, used car dealer fix ups. Use a wheel cleaner and get in between the wheel fins with a bottle brush. Don't use waxes with heavy silicone. You'll wind up with silicone specs all over your show car. The best tape for taping off is the blue painter's tape. It's pricey, but goes a long way. It comes off easy and doesn't leave residue or pull the paint off. Don't get polish of wax on rubber moldings. You tape that sticks well, but also comes off the moldings without creating more problems. Use a new product called Showroom New to renew rubber First you apply a gray or black dye. Let the dye dry and then apply the white polish.